January (Jan.) is the first month of the year in the Julian and Gregorian calendars, coming between December (of the previous year) and February (of the current year). It has 31 days. January begins on the same day of the week as October in common years, and April and July in leap years. January ends on the same day of the week as February and October in common years, and July in leap years. Snow in January in the Northern Hemisphere, where it is a winter month. January and February were put on the calendar after all the other months. This is because in the original Roman calendar, winter did not have months. Although March was originally the first month, January became the new first month because that was when people chose the new consuls (Roman leaders). The month has 31 days. January is a winter month in the Northern Hemisphere and a summer month in the Southern Hemisphere. In each hemisphere, it is the seasonal equivalent of July in the other. Perihelion, the point in its orbit where the Earth is closest to the Sun, also occurs in this month, between January 2 and January 5. January begins on the same day of the week as October in common years and on the same day of the week as April and July in leap years. January ends on the same day of the week as February and October in common years and on the same day of the week as July in leap years. January is the only month of the year that always has a "twin" - a month that both begins and ends on the same day of the week as it does. In a common year, this is October, and in a leap year, July. Every year, January both starts and finishes on the same day of the week as May of the previous year. In common years immediately before other common years, January starts on the same day of the week as April and July of the following year, and in leap years and years immediately before that, September and December of the following year. In common years immediately before other common years, January finishes on the same day of the week as July of the following year, and in leap years and years immediately before that, April and December of the following year. The first day of January is called New Year's Day. It is said that it became this date when Roman consuls took office on this day in 153 BC. Different calendars across Europe made this the start of the New Year at different times, as some observed it on March 25. Reaching over from December, the Christmas season in Christianity also extends into this month. Eastern churches celebrate Christmas on January 6 or January 7, and Epiphany on January 18 or January 19 - In Western Christianity this occurs on January 6, with Christmas occurring on December 25. January 1 is celebrated the Solemnity of Mary, the Mother of God, that is a feast day of precept of the Blessed Virgin Mary. Winter scene in Tallinn, Estonia on New Year's Day 2010. The Three Kings, or Magi, who are commemorated on January 6 in Western Christianity and January 19 in Eastern Christianity. Traditional Burns Night supper, traditionally eaten in Scotland and Scottish communities on January 25. Australia Day celebration in Sydney on January 26, 2004. January 6 - Epiphany in Western Christianity. January 7 - Christmas in Eastern Orthodox Christianity. January 21 - Christian feast day of St. Agnes. Martin Luther King, Jr. is commemorated in the United States on the Third Monday in January. Martin Luther King, Jr. Day (United States), third Monday in January, commemorating civil rights activist Martin Luther King, Jr., who was born on January 15. Australian Open - One of the major Grand Slam tennis tournaments. Starts between January 13 and January 19, ends between January 26 and February 1. Auckland Anniversary (New Zealand) on a Monday between January 26 and February 1. The Euro currency came into use in twelve EU member states on January 1, 2002. Photo Montage of the Galilean moons, discovered on January 7, 1610. Landing force preparing to overthrow Hawaii's monarchy on January 17, 1893. 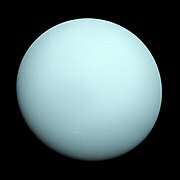 The planet Uranus, photographed by Voyager 2 on January 24, 1986. The Space Shuttle Challenger disaster occurred on January 28, 1986. January 1, 153 BC - Roman consuls are said to have taken office on this day for the first time. January 1, 1801 - The United Kingdom is created, with the inclusion of Ireland. January 1, 1804 - Haiti becomes the second independent country in the Americas, after the US. January 1, 1901 - Australia is given self-government. January 1, 1956 - Sudan becomes independent. January 1, 1959 - Fidel Castro takes over in Cuba. January 1, 1962 - Samoa becomes independent. January 1, 1984 - Brunei becomes independent. January 1, 2002 - The Euro currency comes into use in 12 EU countries. January 2, 1492 - Spanish Reconquista: Granada, the last Moorish stronghold, surrenders. January 3, 1868 - Meiji Restoration in Japan. January 3, 1959 - Alaska becomes the 49th US State. January 4, 1948 - Burma becomes independent. January 4, 2010 - The world's tallest building, the Burj Khalifa in Dubai, opens. January 5, 1066 - Edward the Confessor, King of England, dies. January 6, 1066 - Harold Godwinson is crowned King of England. January 7, 1610 - Galileo Galilei discovers Jupiter's four Galilean moons - Io, Callisto, Ganymede and Europa. January 7, 1979 - The Khmer Rouge in Cambodia is overthrown by Vietnamese troops. January 7, 1989 - Japanese Emperor Hirohito dies, aged 87. January 7, 2015 - Charlie Hebdo shooting in Paris. January 8, 1642 - Galileo Galilei dies. January 8, 1912 - The African National Congress is founded. January 8, 1935 - Elvis Presley is born. January 10, 1863 - The first section of the London Underground opens. January 12, 2010 - The 2010 Haiti earthquake causes many deaths and destruction across Haiti. January 13, 1915 - The Avezzano earthquake in Italy kills 29,800 people. January 13, 1935 - Most voters in Saarland choose to be part of Germany. January 14, 1954 - Marilyn Monroe marries Joe DiMaggio. January 14, 1972 - Margrethe II of Denmark becomes the first Danish Queen since 1412. January 15, 1929 - Civil rights leader Martin Luther King, Jr. is born in Atlanta, Georgia, US. January 15, 2001 - Wikipedia goes online. January 15, 2009 - US Airways Flight 1549 is safely landed on the Hudson River in New York City by Chesley Sullenberger, after experiencing difficulties shortly after take-off. January 16, 2006 - Ellen Johnson-Sirleaf of Liberia becomes the first female President in Africa. January 17, 1893 - American and European sugar planters overthrow the government of Queen Liliuokalani of Hawaii. January 17, 1912 - Robert Falcon Scott's expedition reaches the South Pole over a month after that of Roald Amundsen. January 17, 1991 - Operation Desert Storm in the Gulf War. January 17, 1995 - The Great Hanshin earthquake strikes Japan, mainly the city of Kobe, killing over 6,000 people. January 18, 1778 - James Cook reaches the Hawaiian Islands. January 20, 1936 - King George V of the United Kingdom dies, leaving the throne to Edward VIII of the United Kingdom, who lasts less than 11 months in the post. January 20, 2009 - Barack Obama becomes the first African American President of the United States. January 21, 1793 - King Louis XVI of France is executed by guillotine. January 22, 1901 - Queen Victoria dies aged 81, ending Britain's Victorian Era. January 22, 1968 - Apollo 5 lifts off, carrying the first lunar module. January 23, 1960 - In the Bathyscaphe Trieste, Jacques Piccard and Don Walsh, dive to the deepest point of the Pacific Ocean, the Challenger Deep in the Mariana Trench. January 24, 41 - Roman Emperor Caligula is assassinated by the Praetorian Guard. January 24, 1965 - British statesman Winston Churchill dies. January 24, 1986 - Voyager 2 flies by the planet Uranus. January 25, 1919 - The League of Nations is founded. January 25, 2011 - The 2011 Egyptian protests begin. January 26, 1788 - The first British fleet arrives in what is now Sydney Harbour, Australia. January 26, 1950 - India becomes a Republic. January 27, 1945 - The Red Army liberates Auschwitz. January 27, 1967 - US astronauts Gus Grissom, Edward White and Roger Chaffee are killed in a fire while testing the Apollo 1 spacecraft. January 28, 1935 - Iceland becomes the first country to legalize abortion. January 28, 1986 - The Space Shuttle Challenger explodes shortly after take-off from Cape Canaveral, Florida, killing all seven astronauts on board. January 29, 1996 - Venice's La Fenice opera house is destroyed by fire. January 30, 1649 - King Charles I of England is executed. January 30, 1933 - Adolf Hitler comes to power in Germany. January 30, 1948 - Indian independence and non-violence campaigner Mahatma Gandhi is shot dead by a Hindu extremist in Delhi. January 31, 1968 - Nauru becomes independent from Australia. January 31, 1990 - Moscow's first McDonald's restaurant opens. Statue of the Roman God Janus. January is named after the Roman God Janus, who was the Roman God of doors and gates. The star signs for January are Capricorn (December 22 to January 20) and Aquarius (January 21 to February 19). It is one of three months in the English language to begin with "J", along with June and July, but unlike the latter two, does not have a "U" as a second letter. ↑ "Solemnity of Mary, Mother of God (1 January 2018) - Francis". w2.vatican.va.